If you’re just getting into astrophotography, then the chances are that you should get yourself a good DSLR. Sure, if you’re a total beginner you can get started with your phone, and if you’re an expert you might want to use a CCD. But, there’s a big gap in the middle there for amateur astronomers, and DSLR’s are likely the best choice. In fact, some experts even prefer DSLR’s to other cameras, which speaks volumes. One main reason that DSLR’s are so ridiculously popular is that you can use them for a multitude of things. You aren’t limited to astrophotography if you get yourself a DSLR; you can use it for a bunch of other stuff, too. Not only this, but as cameras improve, they’re getting better and better for landscape astrophotography. This is where you can use the camera alone without attaching it to a telescope. Although there’s no one ‘best camera for astrophotography’, I’m going to give you my opinion on what some of the better options are. If you disagree, feel free to leave me a comment at the bottom and I’ll reply with my reasoning. It’s always nice to hear from other people, whether they agree or not! So, here are some of the cameras that I like. Overall, these are just a few of the cameras that would be suitable for astrophotography. The reality is that if you’re using a DSLR and you already have one, then you can make do with what you’ve already got. If not, then these are some of the better deals that I’ve seen on cameras recently. In my opinion, the best camera for astrophotography on a budget is the Nikon D3400. Why the D3400 and not the D3500? Well, we’re on a budget! Whilst you can get a new D3500 if you’ve got the extra cash, you’re better off going for the slightly older (D3500 was released in 2018, D3400 in 2016) and getting 50mm Nikkor Lens with your camera, too. This way, for a few hundred bucks you’ll really be able to get a good idea of astrophotography and whether or not it’s for you. I like the D3400 because of it’s simplicity. It’s a very easy to use camera – in fact, I find it easy to use as does my son, which shows that it’s definitely perfect for beginners. Although it’s an entry level camera, this doesn’t mean that you need to compromise on quality and you’re going to get some awesome photographs with this camera. It has a great battery life, it’s relatively cheap and it’s incredibly easy to use. Whilst it’s not the perfect camera for astrophotography, align it with the correct lens and you’ll get some great photos. Another reason that you’ll want to consider opting for a major brand like Nikon or Canon is for the sheer abundance of different lenses that you can use. Remember, you don’t need to stick to using lenses that are made only by these big companies – there’s a ton of third party lenses out there nowadays too that you’ll want to consider as well. Overall, as an entry point to photography in general, the D3400 is where I’d start and you’ll find some awesome deals on it right now. Especially after the D3500 was released in 2018, there are some cheap deals around for the D3400. As I’ve said, I’d recommend trying to pick up a cheap D3400 if you’re just getting into astrophotography. But if you’re looking for the next level up, then there are a range of cameras that are suitable for an intermediate level. Much like the development from entry level to middle range cameras in normal photography, the DSLR’s for astrophotography follow the same footpath. In the mid range, cameras start to enter the high three figures to four figure ballpark. 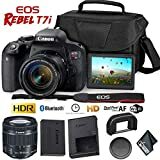 If we’re looking at this range, then my favorite option would be the Canon EOS Rebel T7i . I like this camera for it’s ease of use – the navigation menu is really easy to understand, even for beginners. It’s quite big and bulky for a DSLR, which won’t be everyones cup of tea. But for me, I find it fits into the hand snugly. In terms of image quality, it’s definitely a step up on entry level DSLR’s, though it’s still not a ‘premium’ camera. One thing that you might not like about the T7i is that it doesn’t feel particularly premium or expensive. It’s made out of plastic, and the buttons themselves don’t feel particularly well made. I’ve got to say, it’s a little underwhelming when you take the T7i out of it’s box because you might be expecting something a little more advanced. But in terms of the abilities of the camera itself, then you’re going to be hard pressed to find a better camera than the T7i. It’s undoubtedly one of the best on the market within it’s price range, and even though it’s similar to other cheaper cameras, I do think that it’s worth the price. I’m sure that everyone reading this will be assuming the same thing. There’s only been one camera released specifically for astrophotography in the last five years and pretty much everyone knows what it is. I’m talking of course about the Nikon D810a. And yes, the ‘a’ stand for astrophotography. This camera was specifically designed to appeal to astrophotographers, and it was an upgrade on the Nikon D810. At the time, it was released at an extra $1000 increase in price, which many people found a little bit steep. Though, this may have proved worth it for the added features and it’s excellent high ISO performance and built in intervalometer had many astrophotographers drooling. If you asked me at the start of 2017 what my recommended camera would be for astrophotography, I would’ve said the D810a. But towards the end of 2017, they released the Nikon D850, which became my new favorite camera for advanced photographers. There are a few reasons why I would go for the D850 if you have the budget. Firstly, the specifications on this thing are pretty insane. The battery life is really long, it’s an almost 10 megapixel increase from the Nikon D810, and the back illuminated sensor makes it ideal for night photography. If you don’t want to shoot full res, then you can also shoot at 25.6MP and 11.4MP too. It’s very easy to scroll through your images on the D850, and unlike some expensive cameras, it’s surprisingly easy to navigate. I also like the D850 because it has a ton of lenses that you can use with it. This is essential for any photographer, as a DSLR without a lens is like a lamb without wool. Overall, this is an awesome camera that will be the pinnacle for a lot of aspiring photographers out there. An expensive camera will only get you so far. If you’re not using a tripod, then you’re going to suffer from some blur. And even if you are, you can still get some visionary disturbances when you take the photograph. For astrophotography, long exposure images are best. This gives the camera enough time to draw in light from the light sources (stars etc), which is particularly important at night. Even though cameras have a delay timer, and remote shutter timer is a better option as it allows a longer exposure time. When you start to take your astrophotography a little more seriously, then you need to get one of these. When you’re taking pictures with your camera, you’ll always want to take a RAW image. This is an unedited, uncropped version of your picture taken exactly as it is. If you’re taking pictures in JPEG mode, your photograph is automatically getting cropped to a different size. There is one big bonus of taking pictures in RAW mode – you can change the white balance in your pictures after they’ve been taken (you can’t do that with JPEGs). The white balance of your photos is important, as you want to get the colors right in each photograph. Comas, or comatic abberation, are the bane of the life of any astrophotographer. Comas are essentially flaws in the way that the lens portrays the focussed light. They’re a common issues, and if you look back at some old pictures that you’ve taken, I can guarantee you that you’re going to see some comas around the edges of your pictures. One of a lenses main objectives is to avoid producing comas, but there’s only so much that a lens can do. As a photographer, it’s our job to find the balance between using a high aperture and avoid comas. Of course, with astrophotography particularly we want to use a large aperture to try and bring the light out in the stars, but this does expose us more to comas. So, it’s important that you have your astrophotography settings correct. Overall, you should be able to avoid comas providing that you use the correct aperture and a good quality lens. I’m sure we’ve all fawned over night sky pictures online. The reality is that many of them are heavily edited, and you’re not going to achieve a picture of similar quality without learning how to edit them yourself. For this, there are various different softwares out there that you can use to edit your pictures. Head over to the software page to learn about some of the best softwares (bear in mind I use a Mac). There’s nothing more exciting to me than going off on a random adventure with my camera and getting some pictures of the night sky. But when I look through my astrophotography collection of photos, the better ones are almost always after I’ve used an app to know when the best weather is. This is just a fact, and there’s not much that we can do about it. Whilst I don’t like a lot of things about new technology, one thing is for use – using the right app enables us to get the near perfect photo. From locating the best place in the areas to take good photos, to helping you expand your astronomy knowledge, apps can be an extremely useful piece of the puzzle. Have a look at my favorite astronomy apps to get a better idea of what I use. Overall, if you’re getting started in astrophotography then you should really be looking at getting a DSLR. The ones I’ve recommended are just my personal preference, but there are tons of other options available too. So, you should do your own research before you purchase one. Astrophotography is an awesome hobby and it doesn’t have to be super expensive to take up. Match one of these DSLR’s with a cheap tripod from Amazon and you’re pretty much good to go. Just remember to enjoy yourself and not worry too much about the quality of your photos in the beginning. With time, your photography skills will get better – and so will your images. My Favorite Mid Range Camera!